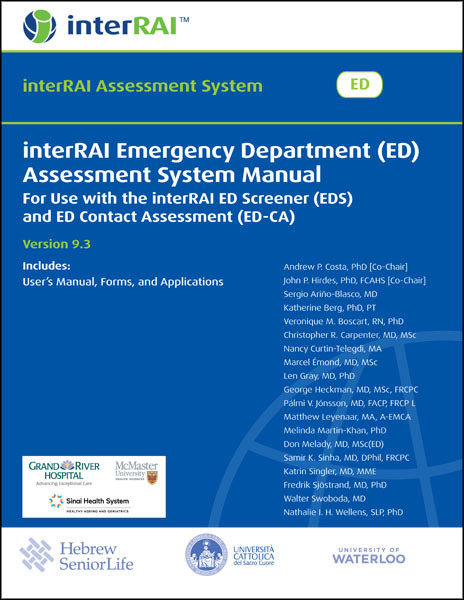 The interRAI Emergency Department (ED) Assessment System Manual is a key component of the interRAI Hospital Assessment Systems. It is designed for use among older patients who visit the emergency department. The interRAI ED is a two-step screening and assessment system. Two consecutively administered instruments within the interRAI ED Assessment System define this two-step protocol: (1) the interRAI ED Screener (EDS), and (2) the interRAI ED Contact Assessment (ED-CA). This book is one of six titles included in the interRAI Hospital Assessment Systems. When purchased as a bundle, these titles are eligible for a 20% discount off their individual list prices. The interRAI ED is included all three of these bundles -- click the bundle name below to learn more and to place your order.